Raymond Lam (林峯) will play Luk Siu Fung in the upcoming mainland Chinese television drama, Lu Xiaofeng and Hua Manlou <陆小凤与花满楼>. Luk Siu Fung, the main protagonist in the self-titled wuxia novel series, was written by the late Gu Long (古龍). The series have been adapted numerously into films and television series. Hong Kong’s TVB was the first company to adapt the mystery thriller novel into a television drama in 1976, which starred Damian Lau (劉松仁) as Luk Siu Fung. Alex Man (萬梓良) portrayed the character 10 years later. Jimmy Lin (林志穎) and Eric Suen (孫耀威) portrayed the character in the 2000 and 2001 Taiwanese television adaptations respectively. Mainland China’s first adaptation of the character was in 2006, in which Chilam (張智霖) starred as Luk Siu Fung in a 20-episode television drama. Raymond Lam’s Lu Xiaofeng and Hua Manlau will be the fifth television drama adaptation of Luk Siu Fung. Zhang Xiaolong (张晓龙) will be costarring as Luk Siu Fung’s best friend, Fa Moon Lau. Raymond was reportedly paid 500,000 RMB for the role, a report that Raymond chose not to respond to. Raymond was seen donning Luk Siu Fung’s signature mustache on the set of the camera commencement ceremony. Netizens noted that while the project appears to be a high-budgeted production, Raymond’s image as Luk Siu Fung is “too simple.” Other fans expressed that they are looking forward to see Luk Siu Fung coming into their television screens again. Produced by West Coast Media, Lu Xiaofeng and Hua Manlau also stars Lan Xi (斓曦) as Sheung Koon Dan Fung, and Zhang Meng (张檬) as Ah Shun. Kent Cheng (鄭則士) and Leanne Liu (劉雪華) have also reportedly joined the project. Lu Xiao Feng has several books so you may watch one adaptation of a different book rather than another one. I am tired of remakes and Ray does not look the role. I think Damian and Alex looked the character more. Eric and Jimmy Lin were big miscasts. Actually, Jimmy Lin and Eric Suen’s versions are Singaporean productions. I hope this series gets dubbed. I can’t sit there for too long listening to Chinese mandarin, hurts my eardrums. Then again, Cantonese dubs are bad too. Aiyah, dilemma! Is the book any good? Raymond Lam looks better in a suit and tie, not this look with a mustache. But at least he dowsnt need to shave his head, so it’s ok. The book is the most famous one of Gu Long, so do you think it can be bad? If I knew would I be asking? Don’t have to bestark snark with your comments. In other word, most of ppl who read it (the chain of series with LXF as main character) think it’s good, if you wanna know about generalization. Among the novels of Gu Long, LXF is highest evaluated. I personally prefer the stories and writing style in Chu Liu Xiang. But, the Lu Xiao Feng series has more interesting side characters. It depends on what you like. LXF is one of GL’s most popular novels, however, that does not mean that everyone has to like it. It has a series of books and some can be better than others. You should read some and see if you like it or not. Hard to answer because taste is subjective. Gu Long’s novels can sometimes has a weak end like LXF’s book 6. But, I find his writing very easy to read. He is also very good in ivoking emotions in a scene. If you like detective stories and interesting characters, you will most probably like LXF books. ANYONE with a moustache dosent look good, so the role could be anybody. I dont understand what the criticism of Raymond being “too simple” is relating to at all. How more complicated can it be? true he doesnt look too bad. but michael miu was WAY WAY MORE HANDSOME 🙂 AND MANLY. He still looks great now!!!!!!! His wife doesnt age so well though. She was very pretty back then. raymond lam good singer not good actor. Anyone know tall is he?? i think 5’8 or 5’9 max but his profile said he was 5’11??? I like Zhang Meng, the one who was born in 1988. The one who was Harjol, with Hawick Lau. She was so beautiful. He should be around five nine. Those profile, you always subtract two. Thats what I always do and I find it more accurate when you subtract two. Raymond Lam looks totally miscast. The moustache is just so wrong, i don’t even know where to begin. Eeekk. Many people felt Julian Cheung was a miscast too when the news first came out of his casting. 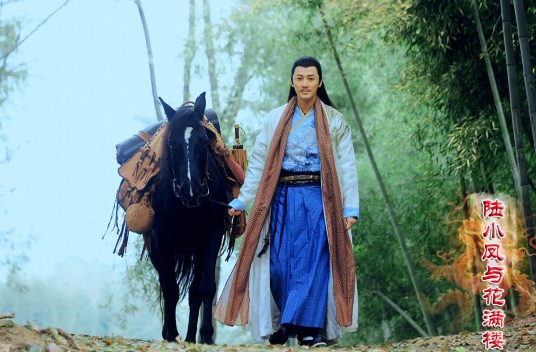 But, he turned out to be a great Lu Xiao Feng. He’s the best LXF to me, although some fans felt Damien Lau is better. Maybe Raymond will give us some surprises. Lets give him a chance. Which adaptation was it with Julian Cheung? year? I can’t find it anywhere! And I agree, lets give LF a chance. I don’t think he looks THAT bad, tbh. Well, that’s still only my personal opinion. Many ppl dun read the novel before judging, it leads to the default criticism. Personally, I think Alex Man’s version was the worst, following by Jimmy’s. Alex Man’s is simply not LXF, nothing match the chac except his smirk. Kidd is right. Why must be skeptical of everything? Why don’t you give Ray a chance to prove he can be a great LXF? Here’s the info on Julian’s LXF series. And here’s the themesong. Very catchy. Haha lolly, he does look like a yeung (look) sui (bad) ham sap lo! LOL, majority of time a moustache will make a man look sleezy. Vincent Jiao would be a better Luk Siu Fung, he was very handsome in Xiaoli Feidao and Yang Zhong Bo role. Xiaoli Feidao’s Mr. Li is totally different to LXF in term of character :). Vincent Jiao dun have the “氓” look that LXF requires. If he is 10 years younger, maybe he’ll suit the role Yip Kai in September Eagle. =)) have you ever read the LXF novel? Stop pretending to be expert at everything Fox! You’re only expert at responding to anything remotely negative about Raymond Lam. As a matter of fact I have umpteen years ago! I don’t assume, because from wat you’ve said, you don’t sound like you have read the novel to know the character. And all I can say to you is: You are as biased as me, so don’t act like you are sooooooooooooooo neutral and saying the truth. Btw, I’m an expert of stepping on somebody’s tail, such as you =)). Maybe Puff did read it but so long ago so he/she does not remember much about it anymore?? I read just parts of it here and there a long time ago, so don’t really remember either… No need to jump to conclusions so quickly. Well, if she isn’t Puff, I will say differently, HTS. There’s no point discussing with someone who is as dogmatic as Fox. I did read it, I know luk siu fung is meant to have a moustache but I still think the moustache look shown on the photos, aka Raymond Lam look so wrong, so bad. Private matter between me and Puff girl. Ask if Puff ever tries to be nice to me or others who dun share same interest with her. @fox, how private can it be when it’s in a forum like this. Anyhoo, I remember puff was nice to a number of diff pple she disagreed. I remember reading one recently too. You’re just way to sensitive and self obsessed!!!! @puff, wah I had to check dictionary for dogmatic meaning. Very apt. You are welcome and I really wonder what is going on with you and Fox. I am guessing is it because she loves Raymond while you don’t?? About reading novels, who can remember everything?? My mom used to have a great memory and has read most of JY’s novels and some of GL’s. However, that was many eons ago so of course she does not remember much but still does remember some. But of course who can remember the details of such long novels??? Good point and if it is that private, then why is it being bought up in a public forum like this??? Some fans are just way too supportive and die hard to accept others’ views and opinions. I remember that Puff is pretty nice for the most part. Definitely not because she likes him or not because I can talk nicely with many who hate him so much. But not Puff. I don’t know how Puff is nice to anyone especially the ones who share same interest with her, but definitely not me and someone I know. So it’s the private matter that we are having problems on each other. And when I say of private matter, I’m referring to how I know she didn’t ever read it and just commenting for the purpose of commenting. Btw, lolly, I don’t know you so I won’t question you, feel free to support Puff. This is the best example to say why I’m picking on Puff :P. Hence lolly, you don’t need to be worried. And to Puff, the word dogmatic is also perfect for you. I said, we are much the same, so don’t try to act like you are a saint :P.
HeTieShou, I am not sure why I’m targeted. I don’t go around and hunt down certain people’s comments and target them, waste of time and effort. Thanks again lolly and HeTieShou. For the most part I’m nice, but I will respond when targeted by cyber bully. OMG poor the weak Puff. If you have ever rmb-ed wat you’ve done in the past in a different username. However I’m really speechless with your weakness, so I’ll let you alone with your non-existence cyber bully. Fox, you’re delusional. I have not criticised you under a different username. I have not done that in the past, and will never do it. Whatever it is, I think you guys should just let it go since this forum as well as others, should be a fun place for us all to discuss and talk about what we like, right? Therefore, what is the point of arguing and picking on each other?? Peace!!! The title is ‘Lu Xiaofeng and Hua Manlou’. Does that mean Hua Manlou has been promoted to co-lead? I’m so happy. Hua Manlou is my favourite wuxia character. I was disappointed when he came out so little in later LXF’s books. Need to check out who is Zhang Xiaolong. Do you watch 後宮甄嬛傳? He is On doctor in this one. Nope, I have not. I’ll have to google for his picture. He is handsome but dun look weak, so I dun noe if there can be some bromance hints like the version of Julian or not :P. Having to say, the best Huo Man Lou I’ve seen is Ken Chang. But who knows :). This was my thought before I watched the Alex Man version. But, after I watched the Alex Man version, I felt the best Hua Manlou is Wong Wan Choy. Look “weak” :P. Ok I’m a bromance fan haha. Maybe the word “weak” isn’t suitable? I means that Zhang Xiao Long dun have the bromance feel with him. I dun noe if this chance it can change or not. More like a ham sap lo don’t you thing? Sorry my bad, change “thing” to “think”. Oopsie daisy. Coincidentally, LXF is kinda ham sap lo. He’s meant to be flirtatious but not a pervert?! It’s up to how you define ham sap lo. You’re not. Other than the moustache, I find Ray looking gorgoeus in this getup. Gosh, I fell off the chair after see the photo of Raymond as Luk Siu Fung. Obviously, he doesn’t fit this role. He looks very sleepy in that photo. Being handsome doesn’t mean you can be casted in every role and still succeed. We will see how Ray fares in this type of role. I bet he is and is really tired and overworked as usual. Of course no one can be successful in every role that they play and that goes for everyone regardless of your looks. I’ve never read the novel and wasn’t familiar with LXF story. Why would you rather Ray play Ye Kai? I want him to play Ye Kai because to me, he looks more of that role and has played other characters in the past that kind of remind me of Ye Kai. It would be cool to see him shoot the Fei Dao like his master too. But that’s just my wishful thinking and have seen not an adaption of September Eagle in a long long time so would love to see a good one again sometime. Oh so you still want him to act as Yip Kai. But isn’t Yip Kai’s chac a bit similar to LXF (except that LXF likes girls and wine more 😛 while Yip Kai is more of a goodie guy)? But I would like he plays Yip Kai, too because of the girl part, hehe. My most fave part in September Eagle. I agree. Ye Kai was a bright, sunshine type of guy with both intelligence but was still yet fun. Plus he was devoted to Ding Ling Lin. Ray suits the fun and romantic type better. Lu Xiao Fung is quite a complex character to play. My thoughts exactly which is why I still hope that he can play Ye Kai in the near future because he really suits that character more than LXF. That moustache makes him look like a pervert. He does look like a ham sap lo or salty uncle in those moustaches,and he looks haggard. Can understand where the ‘pervertedness’ came from? But haggard? LOL. Why do I have a gut feeling you’re trying to avenge your idols? Who’s doing the casting? LF isn’t suitable as Luk Siu Fung. He looks chok and bored in the pictures and the moustaches look weird on him. We don’t want a bored looking Luk Siu Fung don’t we. I like Zhang Meng. Pretty girl and can act. I see many criticising raymond for looking bad, but from what I google up, most luk siu fung looked bad. Including universally praised Damien Lau. Damien looked like a halfwit boy with a fake moustache. Of course, in acting he’s probably miles above the rest, but I don’t find anything attractive or charming about his luk siu fung look..
At least Raymond looks mature enough for the moustache. Or is luk siu fung described as a young-looking boy with a fake moustache? Is that the reason why jimmy Lin, Eric suen and Julian cheung who are known to have boyish faces are casted in the role? No, LXF is in his 30s. He looks handsome but not young-looking or boyish. 100% agree, except if this statement refers to Adam Cheng from 30 years ago. I am not sure about this one but Gu Loong’s male leads are mostly loners with a past? Like burden filled past? Not like JY who is mostly happy bumbling types thrust into the worst case scenario? Does Raymond have that debonair but burdened past air about him? And why must he have that moustache? Surely somethings can be changed, a little? The mustache is the significant feature of LXF, without it how can know he is LXF? 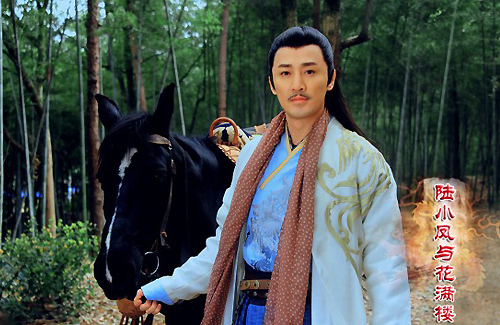 Lu Xiao Feng without the moustache is like Justice Bao without the black face and crescent moon. It’s his signature. I tried to find an example and Kidd, your comparison is perfect :D.
Am I the only one that bursts out laughing whenever I see the promo pics for nearly any Luk Siu Fung’s mustache? He looks just like Ju Got Leung in Back To Three Kingdoms. or what ever his character was called in that drama. maybe Raymond does not have a chok look! but isn’t it good because many people may be tired of his chok look?! anyway, I am his very royal fans…good that he try different role, not just handsome look role, act different character… support him!! !